As someone who has made a career of interpreting historic places, I often ponder why some sites survive, thrive and have a life well beyond their founding days, while others shuffle off, nearly forgotten with the passing of time. Did you know, for example, that Barkerville was one of four boomtowns along Williams Creek during the original Gold Rush? If you had travelled down the Waggon Road on a Barnard’s Express Stagecoach in the late-1860s you would have passed through Richfield before entering Barkerville, and had you carried on further you would have found yourself in Cameronton, and then Marysville. Regular visitors to Barkerville will know that Richfield is still the location of our Courthouse and home base to our excellent Early Justice Interpretation program, but the town itself is long gone. Cameronton, once a thriving village named for John “Cariboo” Cameron, faded away many decades ago and its former setting is now our RV parking lot. Poor Marysville is only mentioned in passing references. In fact, no-one really knows how Marysville got its name. Sorry Mary, whoever you were. The area around Barkerville and Wells is peppered with the locations of former settlements with scarcely a trace of their past glory left to hold and tell their stories. So why does Barkerville live on? There are many practical theories to explain how a wooden boomtown that, by all logical means ought to have rotted away decades ago, survives. A few stalwart residents decided to stay on in Barkerville after the furor of the first Gold Rush had passed, and in doing so ensured it never fell into ghost town status. The Cariboo Gold Quartz Mine had some serious luck in the 1930s, at which point Barkerville became a supply town for Wells, and this also kept it active and relevant. The decision to make Barkerville a heritage museum in 1958 officially shifted its purpose and destiny, and ensured its immediate survival. 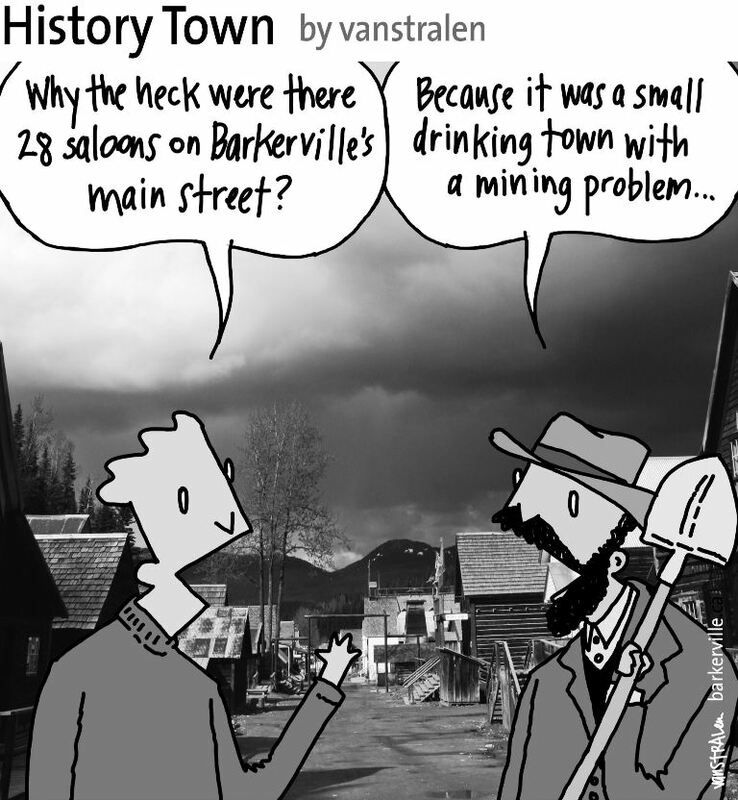 But I believe Barkerville’s resilience goes deeper than luck or chance. Barkerville resonates. There is rhythm to the place, a magnetic vibration that attracts and holds people. Could it be that the ore, still deep in the ground beneath the town, retains the purposeful and heightened energy that built the place? Does our gold-filled creek holdfast the mosaic of narratives of all those who have paused on its banks? Barkerville claims people, captures their imaginations. That is why it lives on. I have seen Barkerville cast its spell on visitors who come back again and again, year after year, and I have seen its effect on the people who come to this area to work and immediately feel a part of an epic, ongoing story. I recently had a visit from a friend who had worked at the Theatre Royal eighteen years ago. He said: “I only worked here for one summer, but the place is a part of me.” I know the feeling. As do so many others. In 1862 Barkerville claimed a little bit of ground high in foothills of the Cariboo Mountains. A century-and-a-half later it lives on in all of the people who have passed through and become part of the ongoing storyline of this spirited little town. We are living history. The above one-panel cartoon by Dirk Van Stralen, with accompanying editorial by Danette Boucher, is the tenth of twenty weekly entries that will be logged – and subsequently blogged – as part of a 2013 collaboration between Barkerville, British Columbia and The Prince George Citizen aimed at introducing some of the quirkier advantages to living, working, and playing in the Cariboo Goldfields. We hope you enjoy!